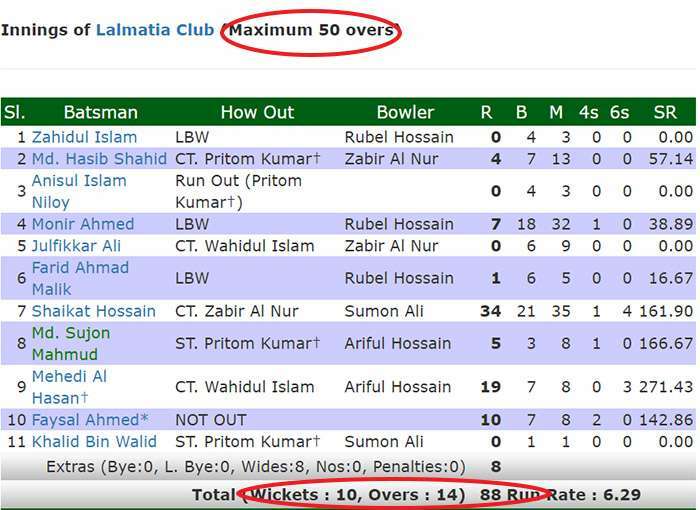 Bangladeshi Bowler Gives 92 Runs in Just 4 Balls & This Wasn’t the Only Match to Have this Ridiculous Scoreline! Cricket is a very popular game so even if a person is not an avid follower of a fan of cricket, he/she will still have some basic knowledge about the game. For example, almost everybody must be aware of the fact that every over has six legal deliveries and the maximum runs that can be scored by a batsman in an over is 36, for which requires a six of each bowl which has happened before but very rarely. More than 36 runs can be scored in an over if the bowler keeps bowling wides and no balls, but that can’t be more than 2 or 3. However, a Bangladeshi bowler did something which was next to impossible. On Tuesday, two clubs ‘Axiom’ and ‘Lalmatia’ were facing each other in the ‘Dhaka Second Division Cricket League’ which was being played at City Club Cricket Ground. 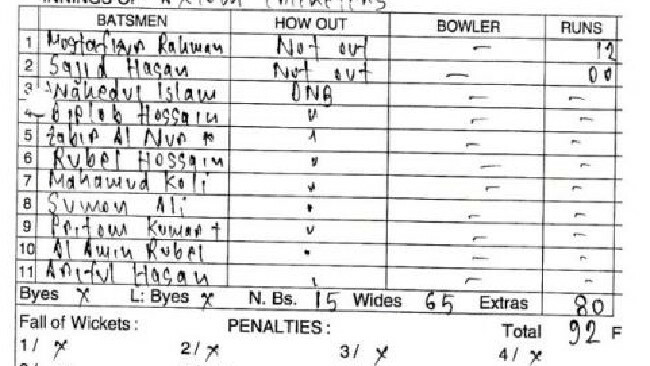 Lalmatia club batted first and was all out of 88 runs in 14 overs and you would be shocked that Axiom got to 89 runs by playing only 4 legal deliveries. Sujon Mahmud, Lalmatia’s opening bowler, took away the opportunity of scoring runs from the batsmen of Axiom by giving 92 runs in just 4 balls. No Jokes. 65 wide runs came from 13 wide balls, 15 runs came from 3 no balls while remaining 12 runs were scored on the 4 legal deliveries. However, it was done intentionally in order to protest against the umpiring decisions that went against the Lalmatia club. The umpiring has become a controversial matter in this tournament and just a day ago, on Monday, Tasnim Hasan, bowler of Fear Fighters Sporting Club, gave away 69 runs in just 7 legal deliveries in order to show anger against the bad umpiring. This may not be in the spirit of the game, but it had to be done.